All eight of my great-grandparents were born in the United States. Climb back just one more generation, however, and we meet my most recent immigrant ancestors: three second great-grandparents. The earliest of these three to arrive in the US was William John Stevens, who immigrated with his parents as a baby. The 1880 US Federal Census enumerated a one-year-old Willie, his three older siblings, and their parents (my third great-grandparents) - Thomas and Susan (Day) Stevens - living with Thomas' younger brother Richard in Idaho Springs, Colorado. It appears that the family emigrated from Newfoundland (well before it would become part of Canada in 1949) to Colorado shortly after William's birth. 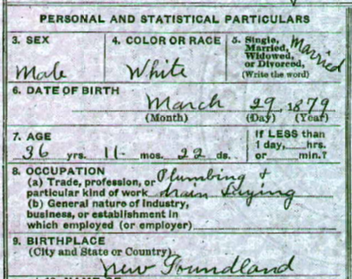 William's death certificate corroborates his birth in Newfoundland and gives his exact birth date as March 29, 1879. The Stevens family's move must have happened sometime between William's birth date and June 1, 1880 when the US census was enumerated. The 1880 census illustrates that the Stevens family was mobile within the soon-to-be Canadian territories before immigrating to the US. We learn that the Stevens patriarch, Thomas, was born in England in about 1845. His wife, Susan Elizabeth (Day) Stevens, was born in about 1843 in Nova Scotia. Their first three children were each born in Nova Scotia. Willie, though, was the first and only to be born in Newfoundland. Geographically, the move from Nova Scotia to Newfoundland is the opposite direction from the United States. 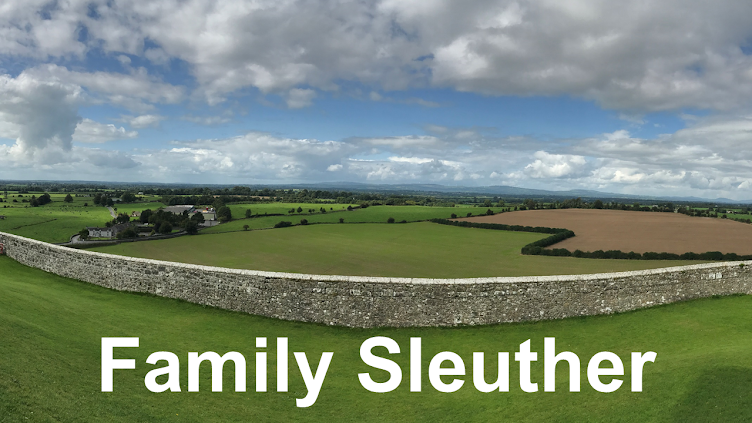 What could have motivated the family's peculiar route? Work opportunities, I assume. Migration paths can be difficult to trace during this time period, but the clues - however faint - exist. A couple additional hints about the family's migration path come from this census and William's death record. First, the birth place for Thomas' brother, with whom the family was living, was enumerated as Wisconsin. It would seem that my fourth great-grandparents had immigrated from England to Wisconsin. I don't currently know their identities. Second, William's death certificate mistakenly states that his father Thomas was born in Michigan. Was Michigan on the informant's brain because the family lived in the state for a time between Newfoundland and Colorado? Was Michigan their entry point from Canada to the United States? I would love to learn more about the immigration story of my third great-grandfather Thomas K. Stevens, which apparently included a trans-Atlantic voyage and then an overland trek across half the North American continent. Born in England in about 1845, there should be a civil record of his birth that would shed light on his parents' identities. What prompted him to sail from England to Nova Scotia? Did he also make the journey with his parents as a child like William, or did he journey alone as a young adult? Immigration stories are fascinating windows into our ancestors' journeys for new opportunities and a better life. Clearly, courage and persistence were required to undertake a move in an era when transit was a time-intensive labor and what awaited you at your destination was uncertain. It's an endeavor for which I have great admiration. Who were your most recent immigrant ancestors? Have you retraced their journey? I have one set of 3rd greats who are unknown and had a son born in Virginia about 1822. I doubt they were immigrants but if they were, they would be the most recent. On my paternal line my most recent known immigrant ancestors came in 1752 (Rupp), 1749 (Honegger), 1744 (Noll), and 1732 (Glantz). I have one (Wiseman) who was born on the 1704 ship! None of my maternal ancestors immigrated to America. These ancestors have always lived in Luxembourg even when on maps the locations may today be France, Germany, and Belgium. Most who were living in 1766 when the first census was taken were found in what was then Luxembourg. I have not found any who came from other parts to settle in Luxembourg. Interesting post and questions, Michael. I may have to set aside some time to do a bit of deeper research into the question. There's something appealing to me about having ancestors rooted in one place for generations. Limited movement makes for easier research. How did you uncover all of those arrivals in the early to mid- 1700s? Did passenger manifests exist and survive? I'm very curious about the resources available. Annette Kunsel Burgert's "18th Century Emigrants from the Northern Alsace to America"
The mid-1700s was a good time to have an immigrant ancestor coming to America. I'll get back to you with the names of the books on archive.org. These are only two examples. Try the search terms emigrants "location" archive.org and or ship lists on your favorite browser search thingy. Your story is a timely reminder that for almost all Americans aside from Native Americans, our ancestors were immigrants---and often long before there was a distinction between legal and illegal immigration. And I, also, am fascinated by their stories. 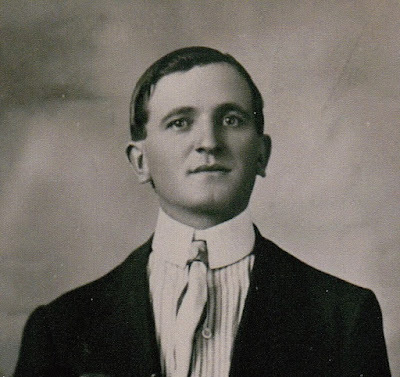 My earliest immigrant ancestor was my 3x-great-grandfather John Nusbaum (born Josua Nussbaum), who came in the 1840s. My 3x-great-grandfather Hart Cohen came in 1851. My most recent immigrant ancestor was my grandfather Isadore Goldschlager, who came in 1940 at the age of 16. Were you able to locate ship manifests for Nusbaum and Cohen? I'm curious, like I mentioned to Cathy, about early passenger records. Hmmm, that should say 1904, not 1940! !